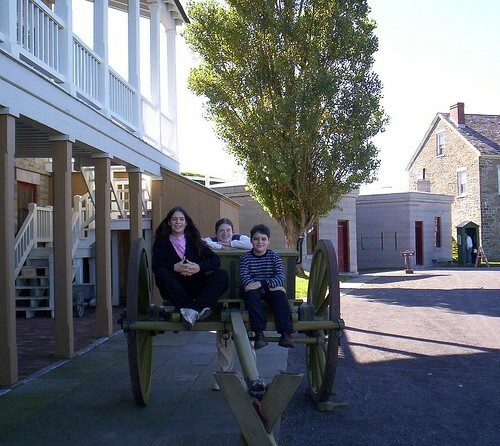 We had been desiring to visit Fort Ontario in Oswego, NY, for years. Finally, in the autumn of 2006, we got to see it! Oswego is a pretty city. The Oswego River slithers right through it. The city reminded me somewhat of Cooperstown, with its frilly, “It’s a Wonderful Life” charm. However, due to the river and the harbor at the lake, Oswego is much more practical and industrious than Cooperstown. Oswego is a college town with a cosmopolitan flair, but it has always had an industrial bent to it and this was very evident as we drove down the streets. 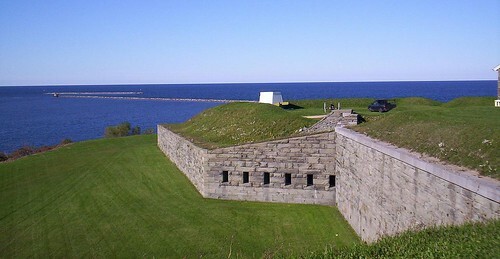 Fort Ontario sits on the southern side of Oswego, and hugs the shoreline of Lake Ontario. It’s a truly exquisite scene, with the sea of blue water at our feet and the sea of blue sky at our heads, and the green lawn glimmering below. We found a parking space and got out to explore the shoreline a little. Through a few small beaten paths, we could walk right down to the edge of the lake and explore the rocky craggs. The kids stuffed their pockets with the smooth, water-weathered rocks. Oh, I could have stood there forever and watched the cool waves. Sailboats glided across the lake, and fishing trawler cranes dangled over the horizon. 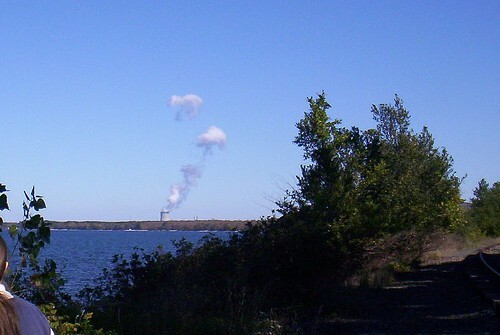 To the north, we could see the nuclear power plant stack. A small cemetery was nearby. 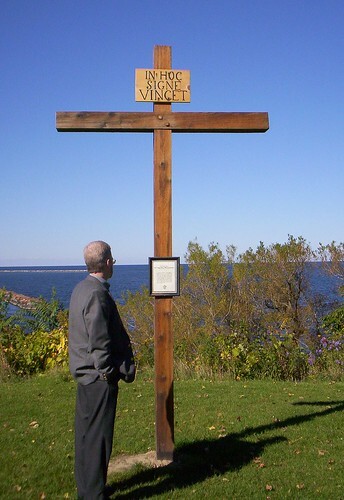 Also of great interest was a large wooden cross, with a sign that read “In Hoc Signe Vincent.” It is similar to what Constantine saw before his great victory at the Milvian Bridge in AD 312. After these things, we entered the fort. 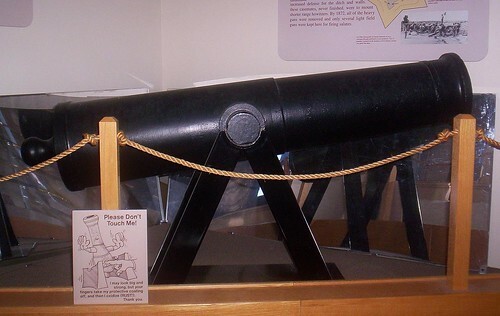 Fort Ontario has a very long history. 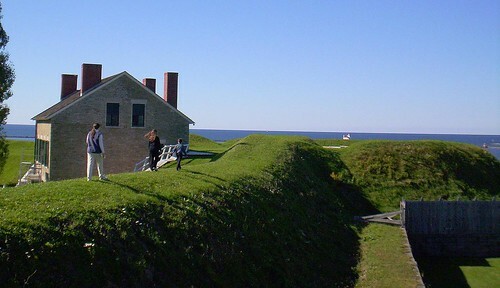 Since 1755 Fort Ontario has been rebuilt, regarrisoned, and changed hands several times. 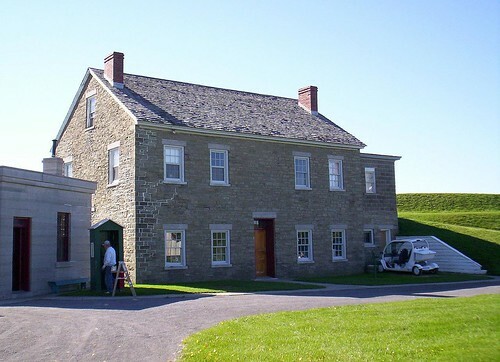 Immediately following the Civil War, Fort Ontario began a period of decreased activity and improvements and additions ceased. 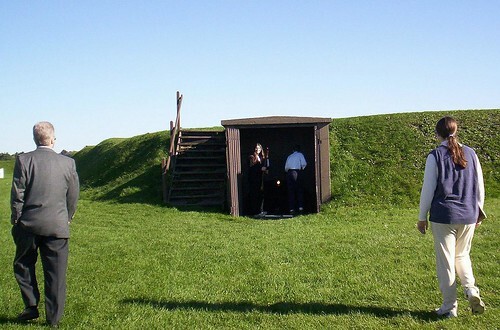 The fort found new life between 1903 and 1905 when the United States expanded the post as part of the army’s reorganization. By 1941 approximately 125 buildings stood at the site. 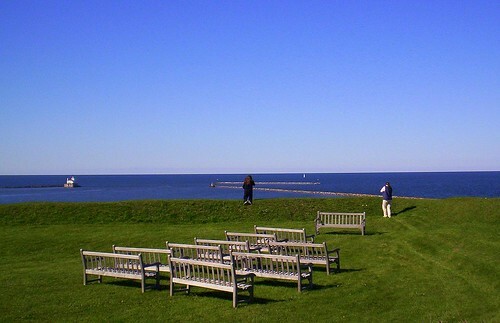 Between 1944 and 1946 Fort Ontario was used as an emergency refugee center for victims of the Holocaust. 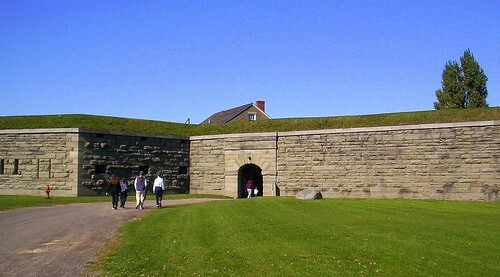 In 1946 the fort was transferred to the State of New York. We drew close and ventured in. There is an admission charge for entering. 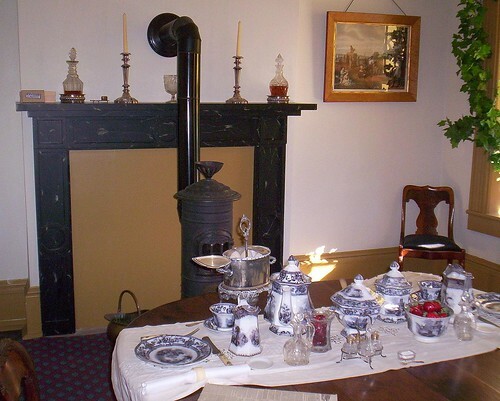 Most of the buildings and grounds were set up for the Civil War period. 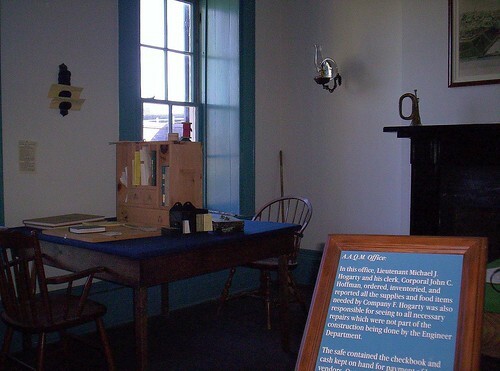 There were an assortment of documents, uniforms, pictures, and some weaponry dating to this era. Very little referred to the Revolutionary days. 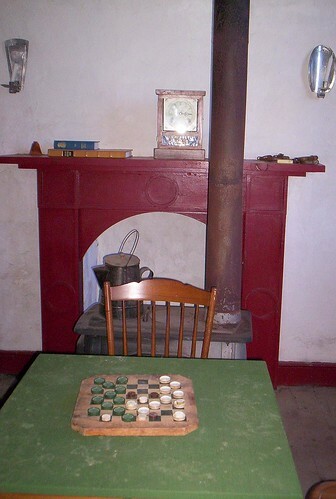 Inside most of the buildings were lots of primitive wooden tables and chairs, some Civil War-era papers and little else. Booooring. 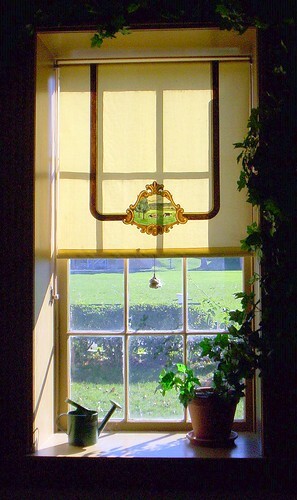 One building was more interesting, as the ladies had lived in it and brightened the drab rooms with lively curtains and furnishings. Women do have a way of making a house nice. I took a shot of a beautifully stenciled window blind. These are lovely, aren’t they? They must have required a ton of labor. 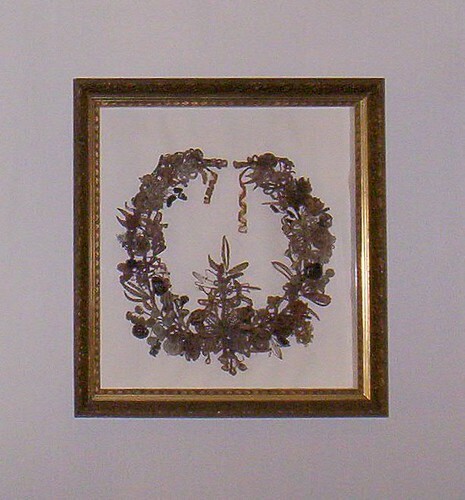 Here’s one of those hair wreaths I mentioned that I saw at the Old Stone Fort in Schoharie. What curious objects! 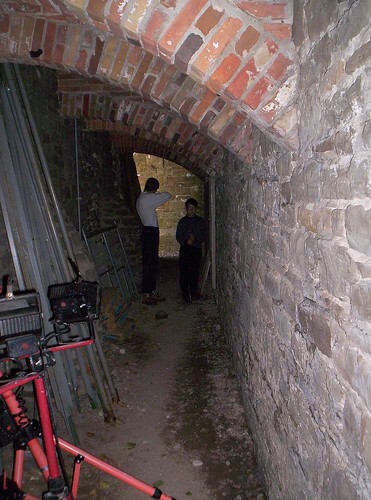 Behind one of the outbuildings, there was a narrow brick passageway that was fun to explore. If you look closely at an enlarged shot of this photo, you can see my son’s eyes glowing in the dark. The camera flash must have reflected off his retinas at the right angle. It looks so creepy! 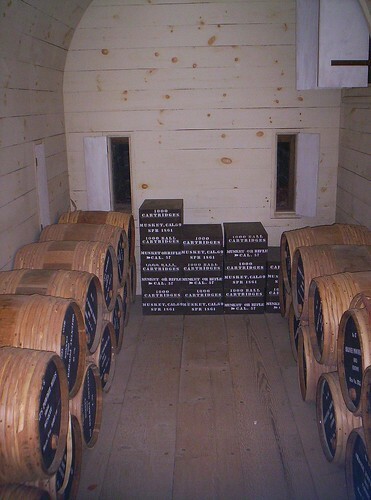 After exploring the four outbuildings in the Fort, we thought we had finished our tour. Lo and behold, we discovered some doors in the ground. This newly found exploratory was the best part of our visit! 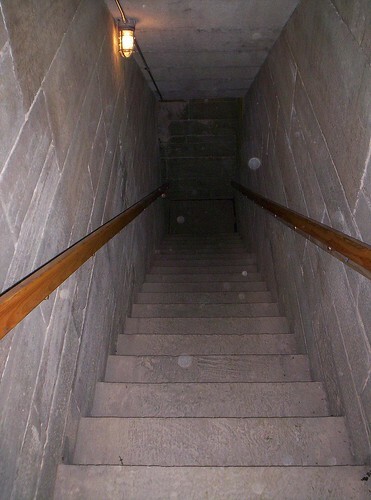 There was nothing down there except empty cavernous hallways and rooms. But my kids loved it. 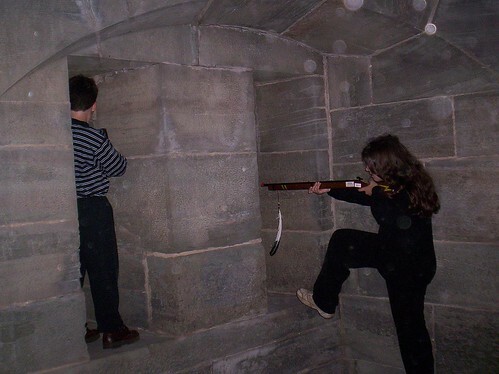 They had bought toy guns at the gift shop and found extreme fun running around and “shooting” enemies from the gun ports in the walls. 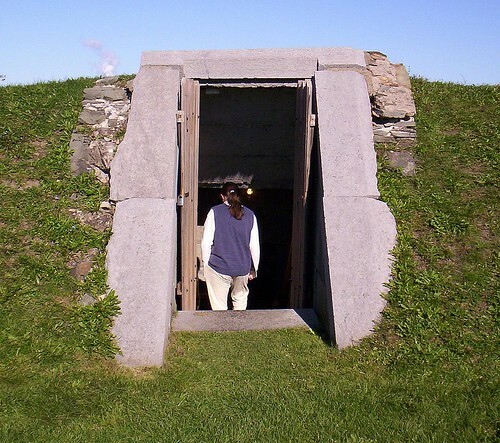 Soldiers had built these underground rooms during the Civil War days. The walls were made of very thick stone. Tiny stalactites were forming on the ceilings of some rooms. It was refreshingly cool down here. It must be heavenly here during the sweltering days of summer. Back outside, I tried to soak as much as I could of the Lake again. 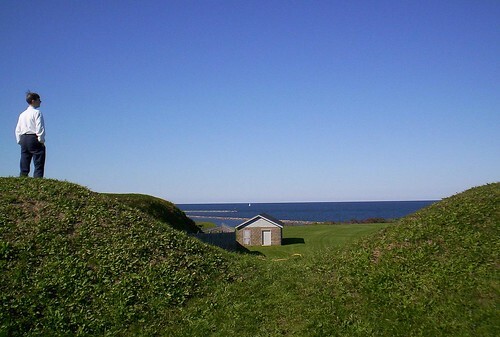 Big berms surround the Fort. This makes for fantastic exploration– we ran up and down the berms and enjoyed the gorgeous views. It was a wonderful visit. The fort, for all its thrilling history, took full advantage of its location by the lake. If you go, go on a sunny day and let the great big sky knock your socks off. I love old places like this one, absolutely lovely! I attended a wedding, at the Fort, yesterday. What a beautiful setting. As the couple kissed, when pronounced husband and wife, a cannon went off. After the ceramony the wedding party went above and the groom was allowed to shoot off the cannon…Spectacular!!!! What a memory! So much history and so sad that this state park was almost closed due to our states financial status. This was my first visit and I’ll be sure to go back as a sightseeing visitor. I have the rare distiction of having lived within the fort when I was a baby in the late 40s. Of course I remember nothing about the fort other than what my parents told me. My mother told me about the cemetary where there was a headstone of a young drummer boy. Mom always said how sad it was that he died so far away from home. 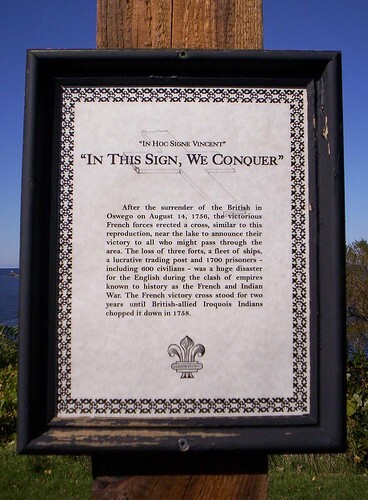 I visited Ft.Ontario in August of 2010 for a Rev-War re-enactment. If you view the fotos 4th and 5th UP from the bottom of the foto line, you will notice little Bubble like things. I got the same things with my camera on several other shots as well, but specifically at the places these fotos show. Spirits of 2 centuries of soldiers? hmmmmmm 1 can only wonder. I have had these at other sites too….Spooky to say the least ! Hello Captain Burr. I’ve received a few comments about the small circular spots that appear in the photos. Nope, not ghosts or spirits. The camera captures the small particles of moisture in the air. It was pretty moist down there.